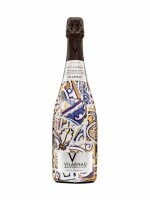 Here’s another remarkable and great value Cava, this one from family owned Gonzalez Byass. The multi-coloured wrap label on the bottle might not strike everyone’s fancy, but the crisp and refreshing sparkling wine inside promises to please most palates. It’s fruity and fun, which means it’s pretty much tailor-made for entertaining or everyday enjoyment.